Every kid can remember their first celebrity obsession. Leonardio DiCaprio, JTT, the crew of NSYNC or The Backstreet Boys might ring a bell…or maybe it was Madonna, Topanga Lawerence, or J-Lo (pre American Idol, of course). For me, it was Abraham Lincoln. Well, I should say it was Bug Hall (remember that little guy who played Alfalfa in the Little Rascals movie? He was also in The Big Green and a few other movies that went straight to DVD). I would have to say that he was my first “crush”. In 1995, Bug Hall starred in a made for TV movie called Tad. It also starred Kris Kristofferson as Abe Lincoln and Jean Louisa Kelly, among a slew of other has beens. The film was about Lincoln’s relationships with his sons, one of which died during his presidency. I didn’t know anything about Lincoln before watching this film, but afterwards, my life changed completely. I would have to say that Tad was the reason I became so obsessed with Abe Lincoln. It was also the reason I took up playing trumpet in 4th grade (my goal was to eventually play “Hail to the Cheif” when I inevitably met the President). Ever since I have been mystified by this man of so few words. I read several books, saw tons of documentaries and even traveled to Springfield to see his place of birth. I was such a nerd that I even dressed up as Lincoln for Halloween…twice. I had a board game of Lincoln trivia and even turned my 3rd grade final project into an illustrated mini biography of good ol’ honest Abe. As the years have gone on, I’ve still loved learning about Abe Lincoln…and as luck would have it, Steven Speilberg’s movie, Lincoln, just happens to come out on my birthday! It’s fate. 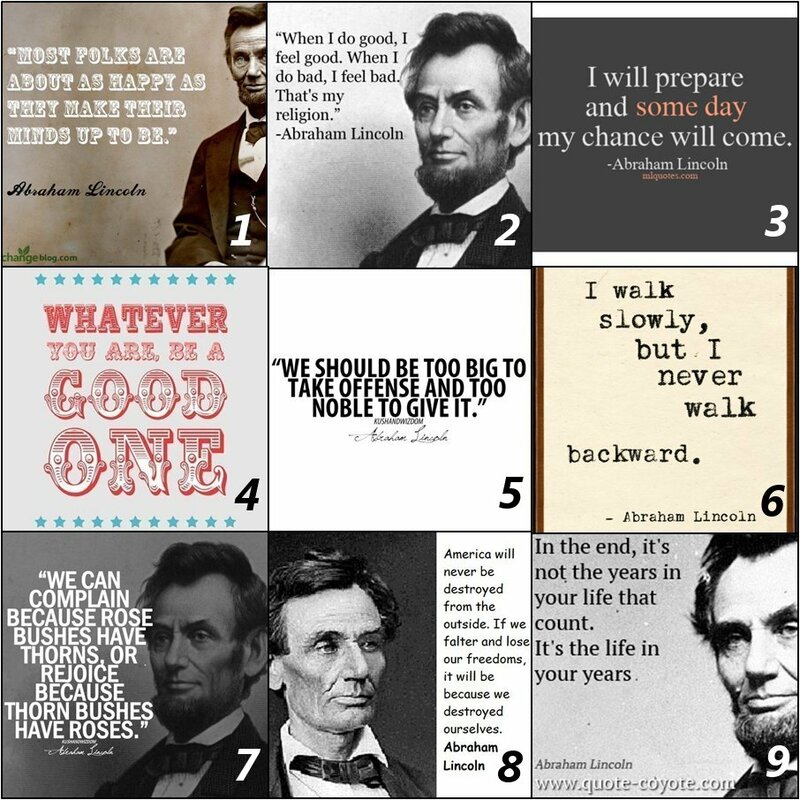 So to help celebrate and honor our 16th President, here’s a selection of some of his most beloved quotes.